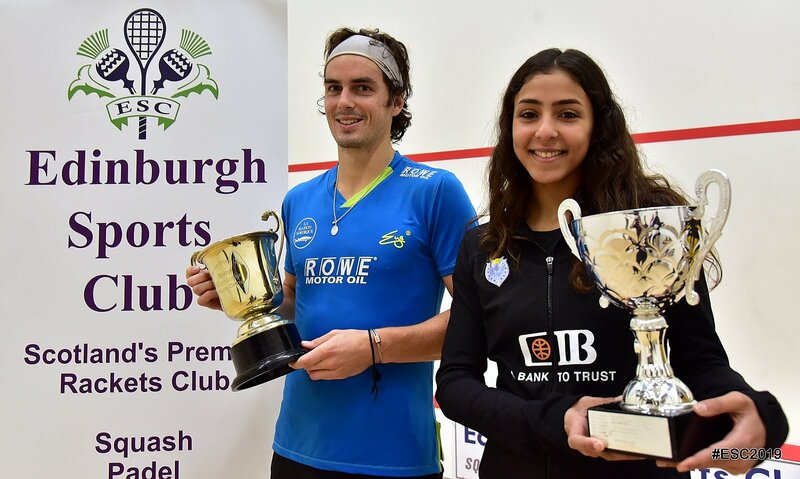 Paul Coll and Hania El Hammamy are the 2019 Edinburgh Sports Club Open champions after comprehensive victories in today’s finals. Hammamy, the second seed, completed a full set of three-nil wins as she beat top seeded American Olivia Blatchford Clyne, taking the early initiative as she took both opening games 11-5. The third was closer as the the 18-year-old Egyptian edged ahead from 3-all, but although she maintained the lead she wasn’t able to break away as Olivia worked hard to stay in touch. Hania reached match ball at 10-8 and needed just one chance as she put it a precision drop to claim her third, and biggest, PSA title. “I think I controlled the first two games well,” said Hania. “But the third was really close and I had to work hard to stay ahead, I really didn’t want it to go to a fourth. Coll took on England’s James Willstrop, and the match followed a similar patter to yesterday’s semi-final against Daryl Selby, the Kiwi getting the better of the opening games but making his opponent work so hard in those that the third was more comfortable. It was a similar story today and Willstrop, feeling the effect of some brutal rallies at the end of the second, went 0-6 down in the third. As the end approached Willstrop asked for a let … “It’s got to be, I’m two-nil down and getting hammered,” he pleaded, and the ref (from Yorkshire) agreed. It was only a stay of execution though as Coll wrapped up the title soon enough. “It’s been a really good weekend,” said the new champion. “The atmosphere has been great from the start and I’ve loved playing on this court with a big crowd, even if not many of them were supporting me!